Self Opening Kitchen Scissors With Large Handle. With a large, ergonomically designed handle that is easy to and comfortable to use, these self-opening scissors are a welcome addition in any home. They have a spring loaded self-opening mechanism that re-opens the scissors after each cut, making them ideal for limited strength users. 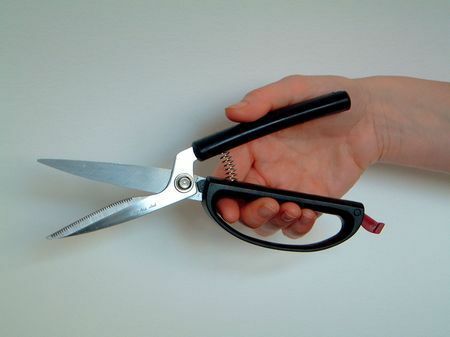 The scissors have strong stainless steel multi-purpose blades that will cut through a large number of materials, and a safety lock that keeps them securely shut when not in use. I have just bought 3 more pairs of these scissors for my sister and friends as my pair has proved so fantastic. Earlier in the year I had an episode of de Quervains tenosynovitis, giving me pain in my wrist and thumb. As I love to sew I was very upset to find it so hard to cut fabric. I was willing to try anything to make using scissor less painful. Although these scissors were advertised as being kitchen scissors I thought I would give them a trial. In fact they were much better at cutting fabric than my expensive dedicated dressmaking scissors. They give me better control of detailed work and I can even use them back to front and with almost no pain. I'm sure that using them allowed my wrist to heal quicker. I allowed my friends to try them and they were all impressed, so I've treated them to a pair each.